The 2.8MeV ultrafast electron diffraction system developed in-house, achieving a temporal resolution of 130fs with 10^6 electrons/pulse. The overarching goal of this group is to understand the roles of property-sensitive nanoscale structures and defects in technologically relevant materials such as superconductors, multiferroics, spintronics, and other energy related materials including catalysts, thermoelectrics and batteries. In particular, material systems with strongly correlated electrons are at the forefront of modern condensed matter physics, where understanding the role of structural defects and disorder, and the interplay of charge, spin, orbital, and phonon could unlock the fundamental mechanisms of basic science and novel technologies. 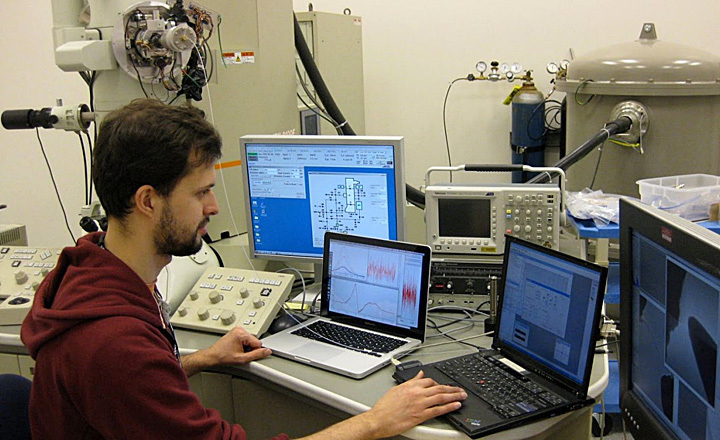 Our unique adeptness in designing, developing, and employing novel instrumentation and methodology in electron microscopy and scattering allows us to devise integrated experiments to reveal the scientific mechanisms of these intricate materials at required spatial and temporal resolutions, from mesoscopic and atomic length scale to femtosecond time scale. Applying the technical proficiency we have established advanced quantitative electron diffraction, amplitude and phase imaging, spectroscopy, holography, and in-situ excitation microscopy techniques (including pump-probe based ultrafast microscopy) to tackle material problems. Our aim is to address many of the grand challenges in basic energy sciences, by revealing the quantum behavior of electrons and emergent properties that arise from the complex correlations of atomic and electronic constituents. Computer simulations and theoretical modeling are carried out to aid the interpretation of experimental data. In addition to several state-of-the art electron microscopy and scattering facilities, we also use synchrotron x-ray and neutron scattering for our research.